Does this mould-breaking device represent a rebirth for the multifunction printer? 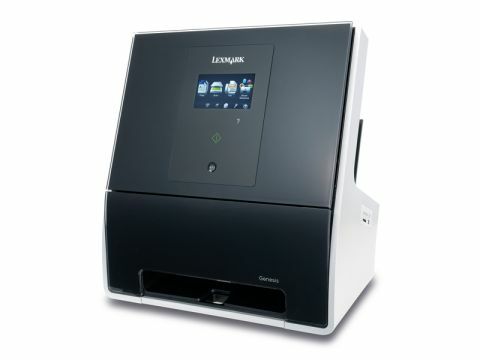 This new Lexmark multifunction device (MFD) is full of fresh ideas. A printer, scanner and photocopier with USB or Wi-Fi 'n' connectivity and colour fax support. The Genesis' optical image capture is based on Lexmark's new Flash Scan technology, replacing the usual reflective scanner with a 10MP digital camera. This makes it incredibly fast, capturing the entire scannable area in just three seconds, with no warm-up time needed. Genesis abandons the traditional form factor in favour of a much more upright design. The 'scanner' is positioned in a near-vertical orientation, allowing for a smaller, space-saving footprint. A clip at the top of the scannable area and a shelf at its foot stop your documents from sliding down the glass. Its 4.3-inch capacitive touchscreen does more than control the device's functions too. After connecting the Genesis to your wireless network, you can download and install Lexmark's SmartSolutions mini-apps. These include a basic calculator, clock display, Facebook and Twitter integration, apps to view, scan to and print from MobileMe, Flickr and Picasa, print your own graph or music paper and even display news and sports feeds from Apple, ESPN and the BBC. Over 60 apps are already available, and more are in the works. But for all its innovation, the Genesis also makes compromises. The camera-based image capture function has a maximum resolution of 300dpi. While this is good enough for most home users, if you need a high-resolution scanner, this isn't the printer for you. Also, its three-second image capture speed is rendered almost moot by the lack of an automatic document feeder. If you've a handful of pages to scan one after another, you have to open the lid and change them by hand after each scan. There's only one paper tray too, an open feeder at the back of the device – inconvenient if you like a second tray for letterheads or photo paper. Thankfully, there's no compromise in print quality. Text output is dark and crisp, remaining readable even at very low point sizes. Our 20-page text document printed in six minutes, five seconds, which is pedestrian but not problematic. A top-quality A4 photo print took two minutes, 32 seconds, which is perfectly acceptable. Default-setting plain-paper photo prints are natural and complete, and when you switch to photo paper and max out the quality settings, the results are commendable, but maybe not quite as good as a recent Canon. Lexmark's Genesis S815 is innovative and ideal for most home users. Versatile and user-friendly, it offers great integration with online services, but it's not the best for high-resolution scanning, fast document printing or stellar photo printing.